active gaming, agility, Cognitive Performance, Coordination and Balance, cowboys fit, dallas cowboys, endurance, Executive function training, exergame, exergaming, fitness gaming, Focus Training, interactive fitness, interactive gaming, MAP training for Physical and Mental awareness, Physical endurance, power, reacting, reaction training, Social Fitness, T-wall, twall, Vision training, Visually appealing design. Cowboys Fit, a brand-new health and fitness center at The Star in Frisco where Dallas Cowboys fans can work toward being their own very best with the same state-of-the-art fitness and recovery equipment used by the players and the Dallas Cowboys Cheerleaders. Part of this new venture was the installation of the tWall 64 in the community facility. The T-WALL is a reaction trainer light wall. 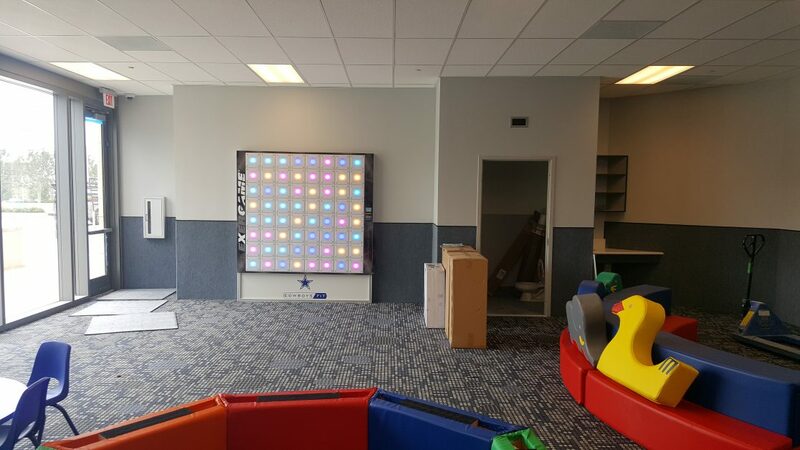 It is simple yet challenging as the user has to deactivate the touch wall lights as soon as it appears. The motivation of the ‘games’ appeals to all ages and ability levels. Whether training for power, agility, endurance, or reaction, the tWALL is the ultimate fitness gaming platform. This universal training tool provides a fantastic cardio workout across numerous applications, including Exergaming, sports, fitness and rehabilitation. We look forward to our continued relationship with Cowboys Fit, New Evolution Ventures, the NFL, and the Dallas Cowboys.